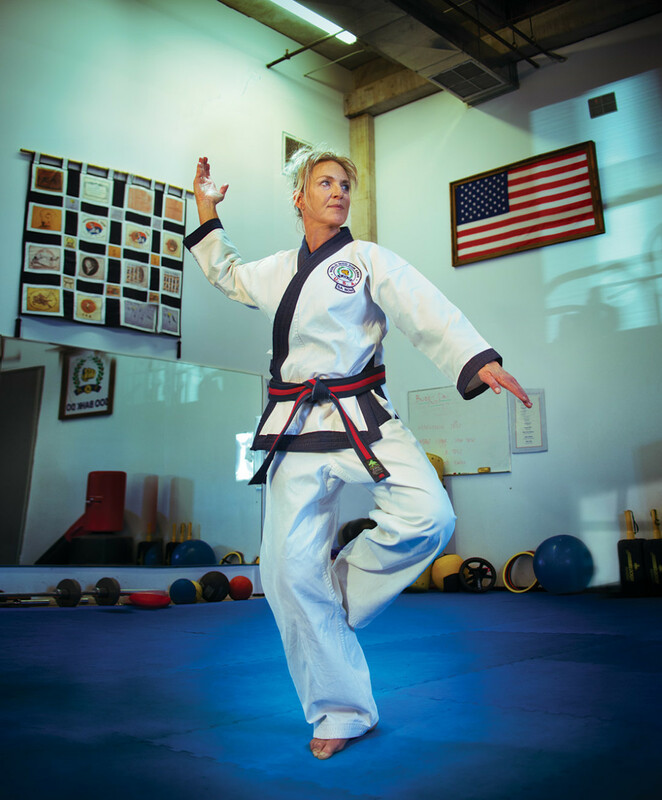 Whether she’s teaching skiing or the Korean martial art of Soo Bahk Do, sixth-degree black belt Jennifer Gibbons is all about respect and community. Aspen Sojourner: You’ve been training and teaching Soo Bahk Do in the Roaring Fork Valley for twenty-five years and recently received your sixth-degree black belt after an eight-day exam in California. How does Soo Bahk Do differ from other martial arts? Jennifer Gibbons: Our founder was always about world peace. The philosophy is that training will reduce your inner and outer conflict. We start with ourselves and our roles within the family and extend that out to community, state, and nation. Soo Bahk Do is practiced on six continents. You can go to any studio in the world, and they will take you in, feed you, give you a place to sleep if you need it. Also our ceremonies, which are all about giving people the utmost respect. AS: How do you demonstrate that? J.G. : We practice the bow and follow a specific protocol. Some people have a hard time with that. But you have to respect yourself in order to be able to show respect for others. And, as with any art, it comes down to the teachers. We have something really special here. Master Jeff Moonitz brought Soo Bahk Do to this valley forty years ago. The Five Moo Do values of Soo Bahk Do—history, tradition, philosophy, discipline/respect, and technique—exist in skiing, too. AS: You moved to Aspen with your family in the late 1960s, after your dad retired from a professional football career with the Detroit Lions. What was it like growing up in the valley with a NFL Pro Bowl tight end as a father? J.G. : My parents owned a bar in downtown Aspen, the Blue Moose, from 1969 to 1975. We didn’t have a lot, but we ate dinner together every night. I wanted to follow in my dad’s footsteps of being a professional athlete and went to college for volleyball. Although we were second in Division II nationally, I was disappointed with the lack of discipline. I started Soo Bahk Do on a whim when I was twenty-six. I walked in the door and was floored by the sincerity of training. Plus, there were a bunch of men in there. I thought, This looks good to me! AS: You went on to win sixteen individual national championships, in both the Forms and Sparring divisions, and were a member of the first all-women team to compete—and win—at the Soo Bahk Do Moo Duk Kwan Nationals. You were also the first American woman to test in Korea for master instructor level, in 2002. How’d you fare in that setting? J.G. : There I was again with a group of men, trying to live up to my dad! I tested alongside twenty-nine men from all over the world. They didn’t know what to make of me: I was this tall blonde, way taller than most of them. But by the end, there was love in everybody’s eyes, and so much respect for the art. AS: You’ve taught skiing even longer than you’ve taught Soo Bahk Do. Are there truisms that apply to both? J.G. : The Five Moo Do values of Soo Bahk Do—history, tradition, philosophy, discipline/respect, and technique—exist in skiing, too. I encourage tourists to learn about our community and to create their own traditions around skiing to make the experience more meaningful. AS: You teach Soo Bahk Do to scores of local kids, some as young as four or five. How do you get them all moving in the same direction at the same time? J.G. : The goal is for each student to realize and control their power. When you take a kid and teach them to bow to their seniors, to slow down and look people in the eye—that has a ripple effect on all their future relationships. My job is to support families in raising good people. AS: What do you say to adults who may be curious but timid to try Soo Bahk Do? J.G. : I envy them! What a great opportunity to be a beginner. They get lots of one-on-one attention. You’ve heard about the graying of Aspen? Well, the main purpose of Soo Bahk Do is rejuvenation and prolonging life through physical and mental training. I strongly encourage more mature adults to give it a try. As my partner Jeff Griggs says: If you train, it’s like your secret weapon. It will support everything else you do.